Bracelet (France), ca. 1860; Attributed to Honoré-Séverin Bourdoncle (French, 1823–1893); aluminum, gold, brass; Cooper Hewitt, Smithsonian Design Museum. Bequest of Raizel Halpin and Dora Jane Janson, in honor of their great friendship and shared love of antique jewelry, 2003-20-1. Cupid—the god of love, attraction and affection—is a well-known symbol of Valentine’s Day. The icon, ubiquitous around Feb. 14, has its roots in classical mythology and has been extensively represented in art. Sometimes depicted as a slender, winged youth, Cupid is more often characterized as a chubby boy. This intricate bracelet, dated to mid-19th century France, depicts two cherubs (or Cupids) supporting a heart cartouche. Likely presented as a gift to a loved one, it is an early example of aluminum jewelry, which was a rare and expensive metal at the time. 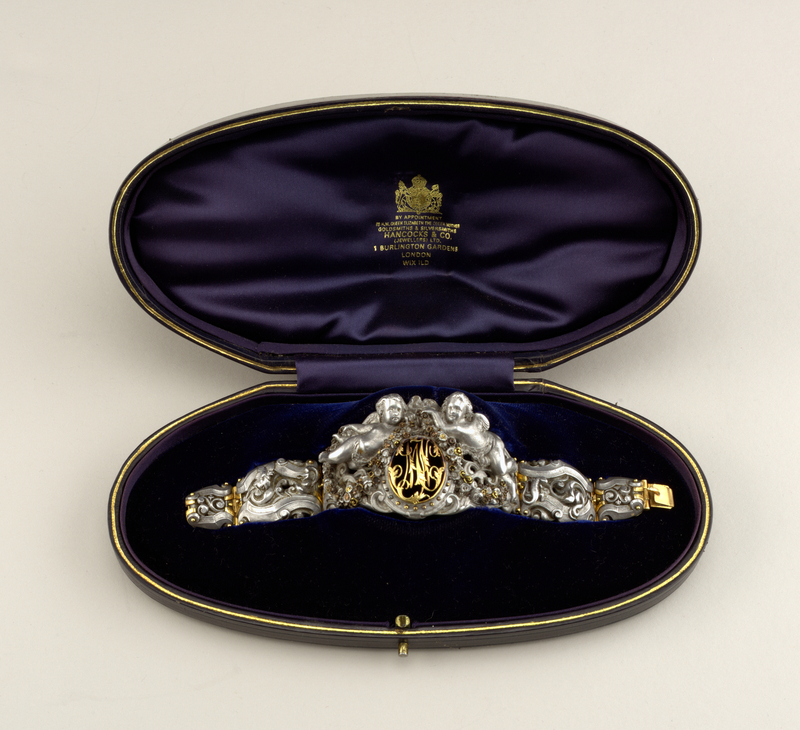 Bracelets like this one were produced as luxury items due to the intensive labor and craftsmanship required to combine the aluminum with other expensive materials, such as gold and gems. The bracelet is believed to have been made by the eminent French jeweler, Honoré-Séverin Bourdoncle, who counted Napoleon III among his clients. While trained traditionally in working with gold, he was notable for creating jewelry featuring aluminum and mixing traditional techniques with riveting, appropriate for aluminum. He won medals at the French Expositions of 1855 and 1877 for his innovative use of the metal. With advances in industrial production during the 1860s, aluminum began to be produced in large commercial quantities, reducing its cost and ending its cachet as a precious metal for jewelry. This piece is a part of the Product Design and Decorative Arts Department of the Cooper Hewitt, Smithsonian Design Museum. Founded in 1897, Cooper Hewitt is the only museum in the United States devoted exclusively to historic and contemporary design. Housed in the renovated and restored Carnegie Mansion, Cooper Hewitt showcases one of the most diverse and comprehensive collections of design works in existence.